The funny thing about Pachelbel’s Canon is that it’s not entirely a canon. It also contains elements of a chaconne. A canon is a piece of music wherein one melody is started multiple times at regular intervals, so it overlaps itself. If you have ever sung “Row, Row, Row Your Boat” or “Frere Jacques“, you know what a canon is. A round (like “Row, Row, Row Your Boat”) is a type of canon. The most rigid and ingenious forms of canon are not strictly concerned with pattern but also with content. Canons are classified by various traits: the number of voices, the interval at which each successive voice is transposed in relation to the preceding voice, whether voices are inverse, retrograde, or retrograde-inverse; the temporal distance between each voice, whether the intervals of the second voice are exactly those of the original or if they are adjusted to fit the diatonic scale, and the tempo of successive voices. However, canons may use more than one of the above methods. In other words, different “voices” in a canon can undergo different transformations. If Voice #1 is the first melody, Voice #2 can come in x-number of beats later, played on a different instrument, perhaps in a different octave, even perhaps playing the same melody backward. The point of a canon is to take the same melody and play it off itself multiple times, even if the melody as a whole is transformed in some way. What do those terms “tonic” and “dominant” and whatnot mean? Well, I’m not going to get into it here, because that’s where my brain starts hurting. I’ll just summarize and say that those terms describe where a note falls within a chord. WAIT, WHAT ABOUT THE GIGUE? You may have noticed that the name of the music is “Canon and Gigue for 3 violins and basso continuo”, and we’ve mostly talked about the Canon. What about this Gigue thing? WHY IS THE CANON EVERYWHERE? It is actually fairly strange that Pachelbel’s Canon can now be found everywhere. As I mentioned before, much of Pachelbel’s prolific work has not survived. In fact, the Canon itself (minus the Gigue) wasn’t officially published and distributed until 1919, about 225 years after it was written. Why is it now everywhere? The fame of Pachelbel’s Canon can be blamed on the 1970s. Recordings of the music were made here and there after the piece’s publication in 1919, but the piece exploded in popularity after Jean-Francois Paillard made a recording of it in 1970. The piece got another boost in 1980, when the Oscar-collecting movie Ordinary People came out, because Pachelbel’s Canon was the theme song. After that: weddings, ahoy! In a 2011 episode of Dr. Who called “Let’s Kill Hitler”, the song appears just before Melody crashes the party. Actually, if you’re looking for a rockin’ version of Pachelbel’s Canon, Taiwanese composer Jerry Chang made a rockin’ version of the Canon online. Back in 2006, it went viral to the point that news organizations took notice. While Green Day’s “Basket Case” does not directly refer to Pachelbel’s Canon, it definitely has the same bass line and structure. The tune also appears in the video game Bioshock Infinite, which came out earlier this year. 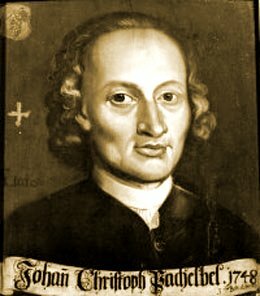 Where have you heard Pachelbel’s greatest hit pop up lately, dear readers? Next Post:Sound and the Foley in the Wild! Pretty sure it was also used in “Cosmos.” The first place I remember hearing it, I think.